The governor kept his commitment to the people of Cancun. In fulfilling the commitment announced a few days ago, Gov. 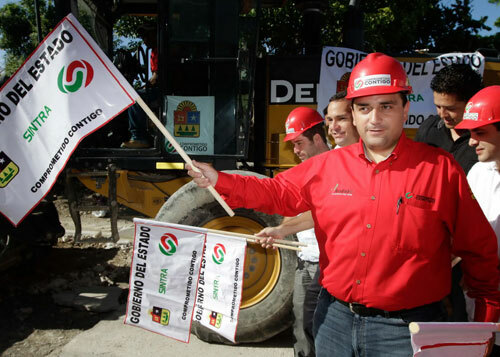 Roberto Borge Angulo gave the green light for the start of resurfacing of streets in the region 75, which placed 72 thousand meters square of asphalt, with an investment of 15 million pesos to benefit 10 thousand inhabitants of that area. The Chief Executive was joined in this act by the heads of the ministries of Infrastructure and Transport (Sintra), Mario Castro Basto, Social Development (Headquarters), Angel Rivero Palomo, Ecology and Environment (Sema), Francisco Elizondo Garrido, the deputies, Paul Carrillo de Cáceres, José de la Peña Ruiz de Chavez and Alejandro Luna Lopez, and the aldermen Marcia Alain Ferrat Mancera and Fernández Piña. In his message he said that before the end of the year he plans to invest another 100 million pesos. It is exclusively for rehabilitation of streets in Cancun, which has already issued instructions to the ministries of Planning and Development, Finance.